On this blog you can follow the latest news and information about the Scottish Parliament in Gaelic. We write the blog in simple Gaelic so that it can be used by learners as well as fluent speakers. We also gloss difficult or technical words in English. If you would like more information about Gaelic in the Scottish Parliament in English, see our leaflet, Gaelic in the Scottish Parliament (pdf). We also have a range of language resources and links for learners and fluent speakers on our website. If you would like to learn a few phrases of simple Gaelic, see our Blasad Gàidhlig (taste of Gaelic) booklet. We have also now added a new page containing audio files of simple Gaelic phrases realted to the parliament on our education pages. If you are intersted in learning Gaelic, see the national Gaelic learning website LearnGaelic.net which is a one-stop-shop for learners at all levels including learning resources and about learning opportunities. 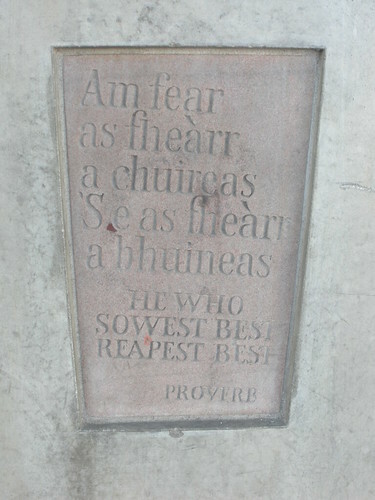 Am fear as fheàrr a chuireas…. Thanks. I’m sure this will be useful as I start to learn more Gaelic. I’m curious though – what is “simple Gaelic?” Do you mean that you try to avoid overly technical terms or is it structured differently from “regular” Gaelic? Somehow I cannot access the ‘Blasdad Gàidhlig’ pdf..